Nepal, a small nation situated in the lap of Himalayas is gifted with cultural diversity. There are uncountable communities stretching from Mechi to Mahakali having their own culture, traditions, costumes and ofcourse, their own cuisine. I have selected one of the most typical dish of a very famous community of Nepal, the Brahim/Chettri community. pujas this is taken as the main item for food. When used as main item, Kheer can be served along with pickled or some curry for better taste. ~ This is an inseperable part of food in the Nepalese death anniversary puja. ~ This is prepared in every religious pujas performed at our homes. ~ This is prepared as a main item in the ladies' festival of Teej as dhar. 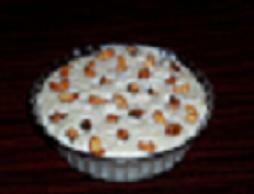 ~ Nepalese believe that it is a must to take Kheer on the 15 th of Shrawan every year. This dish usually has sweet taste because of the excessive use of sugar. So whenever we say kheer we remember it for its sweetness.